I thought it’d be fun to do a post on this based on my own experience of constantly confusing these two wild vege. This is ‘midin‘ (above). 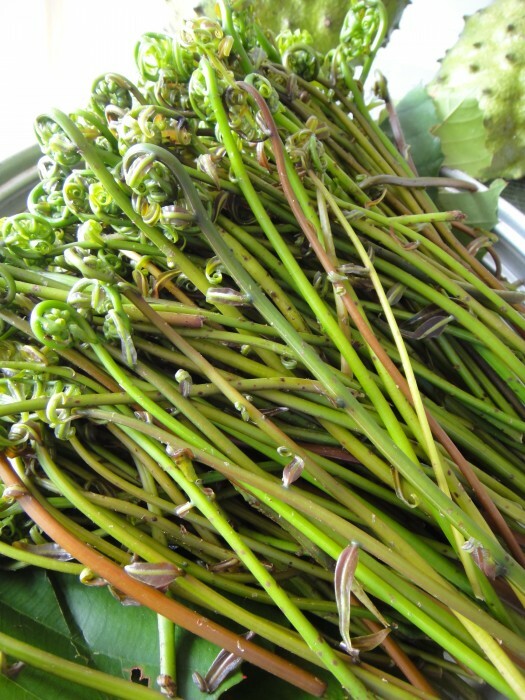 Midin is the official Romanised name for this vegetable but at home we always call it ‘biling’. 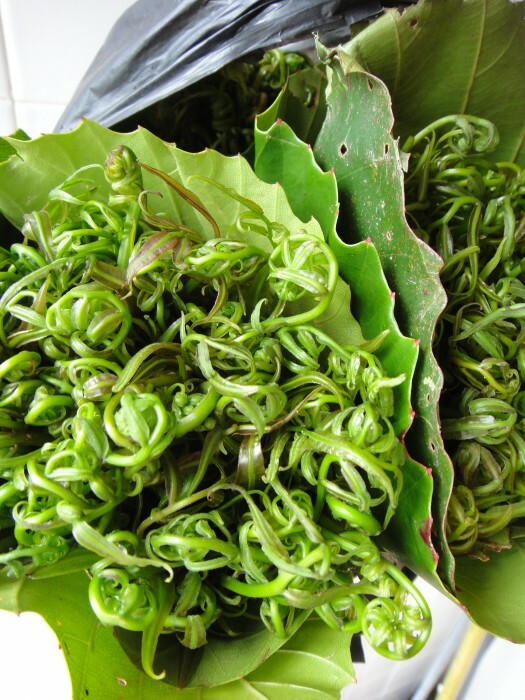 Midin is a sort of wild fern and can only be found in Sarawak. It’s very perishable so you can’t export it to KL or anywhere else. Foragers or gatherers would usually pick them early in the morning and sell them in markets after that. Midin would not even last the next day so it’s best to eat them fresh. 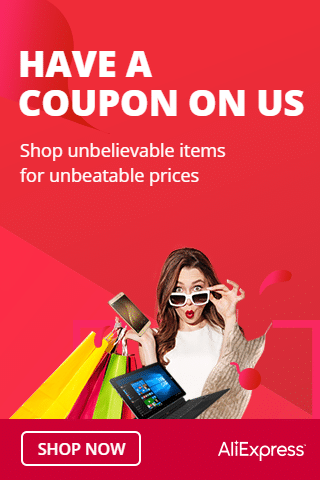 Midin is getting harder to come by these days and prices are going up. When I was back home, mom asked me what I wanted to eat. Midin was in the list but because of tourism, the big restaurants and local eateries are chalking up all the midin stock making it difficult for average folks like us to acquire them, so I appreciated my parents’ effort for driving all over Kuching just to get their hands on some midin. When you purchase midin, they are packaged-wrapped in a huge leaf. You want to be cautious that you’re paying to get more of the stalk part and not so much the foliage because the stalks are what you want to eat. The leaves…not so much. They wilt down anyway when cooked. But it is difficult to see since they always wrap the bottom part and let the tops be revealed. Sometimes, they even put extra newspapers to make it look like a big bundle. My mother would meticulously go through each stalk of midin to break away the hard, inedible bottom. She explained that restaurants are rather wasteful in their prep of this vege because I guess like asparagus, they just cut away the bottom part thinking all of it has tough ends, but that is not always the case with midin. Some are perfectly okay and you won’t need to throw away anything. 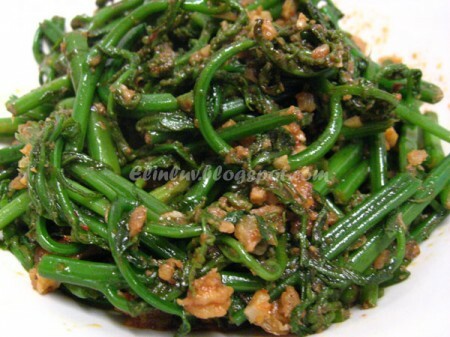 With midin, don’t complicate its cooking, garlic and belachan (shrimp paste) are all that’s needed. Too much and you lose that fresh flavour. Now I did say I was constantly confusing these two plants. 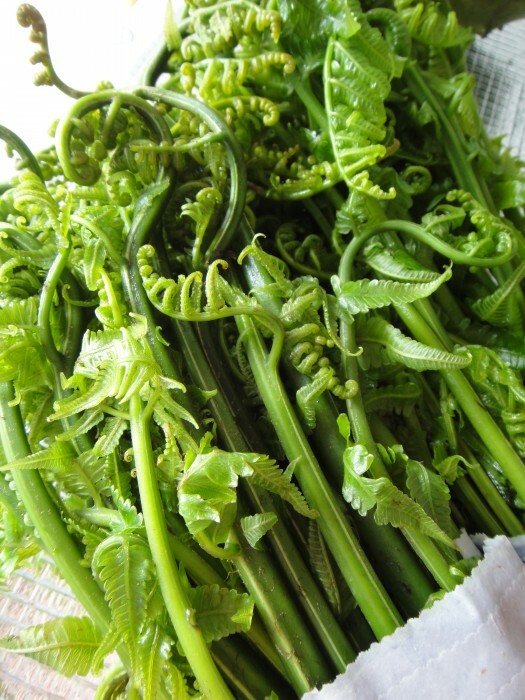 These (above) are ‘paku‘, another type of wild fern. This is more common and widely available everywhere. To do a proper comparison, we bought midin and paku and did a thorough speculation. I forgot to ask my mum about the pricing, but I’m guessing midin cost more than paku. Another speculation I found and this is not always accurate; is that paku is sold wrapped in newspapers rather than leaves. But like I said, this is not always the case. Sometimes they are wrapped in leaves so you’ll just have to look closely at its features to tell the difference. 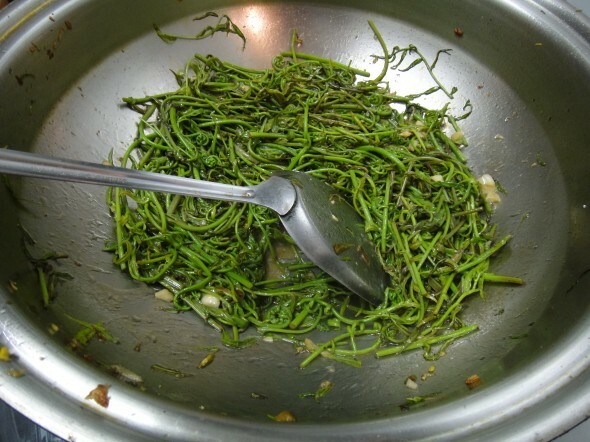 When midin is cooked, somehow they take on a lighter green and retains that way. Paku on the other hand, turns a dark-turquoise green. Midin also retains that curled top while you almost, always don’t see that in paku after it’s cooked. This is my personal analysis based on eating the two dishes but your opinions can change depending on how it’s cooked. My mother just cooks midin simply with some garlic and a little belachan (shrimp paste). Midin has a woodier taste and dare I say, also a ‘wilder’ taste if you understand my meaning. It’s like you can taste it came from the wild jungles and it’s as wild as it gets without any chemicals or fertiliser or even any human care. 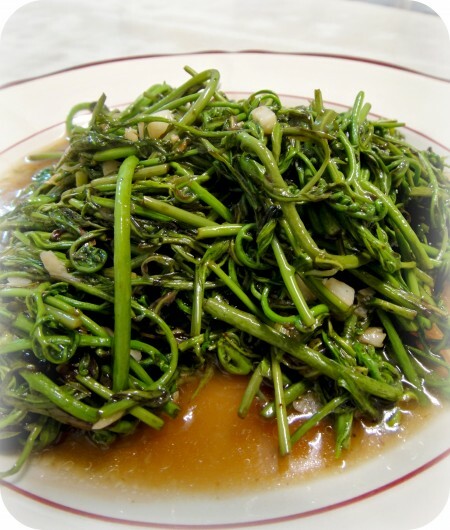 Although paku is also wild per-say, I sometimes find myself being reminded of a cross between long beans and water convolvulus when eating this. I find paku fatter and midin thinner. Almost like double. 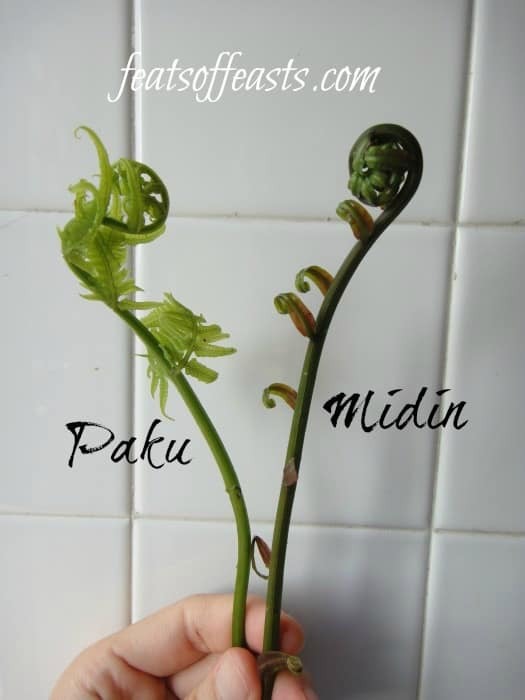 Maybe I’m comparing midin to the paku over here. I don’t know about the paku over there. I fell in love with midin the first time I ate it.. hmmm…. 12 years ago. Waiting for you to help me rekindle it, hahaha. I love Sarawakian food, and fruits too! Bring some worms, if you can! CNY Homecoming (4) – Eve Dinner Bonanza!